As a wannabe Grand Canyon Hiker, the idea of attempting this filled me with an apprehension that bordered on fear. I know it was the same for my wife Melinda. But preparation has slowly replaced fear with knowledge; apprehension with a sense of pride. And more than that, the benefits of hiking the Grand Canyon have started before I even left Colorado. 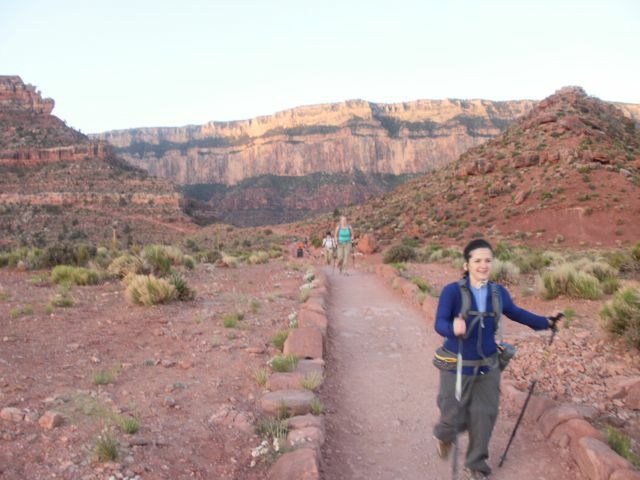 Melinda and I started off training for the canyon by listening to those who have gone before us. But no matter how much advice you get, and no matter how many stories you hear, you have to start doing it yourself before you will start to believe. So we bought our equipment, and set out for our first training hikes. We started off easy with hiking trails like Mt. Sanitas which are rated at moderate and took only two hours to complete. It was a good way to test the gear, see how if fit and sat on us, and to break in the shoes. Recently we moved up to the Bear Peak trail which was rated as strenuous, took six hours to hike, took us from altitudes of about 6000 feet up to about 8500 feet, and which had some spots with 50 degree inclines that had us crawling up the mountain on all fours. But more important than that, it was beautiful, and I had no idea that we had such a lovely hike available to us, so close to where we live. And that is when it really hit me. This Grand Canyon thing is a voyage of discovery, and it begins in your mind and heart, not on the trail. It is a challenge we knew we would have to push ourselves to meet, and we are doing it anyway. In preparing for it we had pushed outside our normal area of comfort and discovered beauty at our own back door, confidence in our ability to achieve, and a hint, just a hint, of the strength we would discover by overcoming the challenge of the GC. Melinda and I have always wanted to go to the top of Pike’s Peak, and we tried to arrange it several times but we always had to put it on the back burner because of one thing or another. But we never felt pressured to get it done, because we live in Colorado now and we can always do it some day. But if you are not careful, some day may never come. Now we are definitely doing it in May, and not only that, we are hiking up it instead of driving up it. A 12 mile hike from 7000 feet elevation to 14,115 feet! Back when I was thinking about seeing the top of Pikes Peak some day, I never would have believed that when I was 47 years old I would hike up it not as a goal in and of itself, but as a training hike to prepare for an even bigger goal!! So I guess what I am saying is this. I have not even left home for the Grand Canyon yet, and I am already grateful for the experience of it. Next post: We Have the Right Altitude, and Are Very Much Inclined, but Can We Take the Heat?